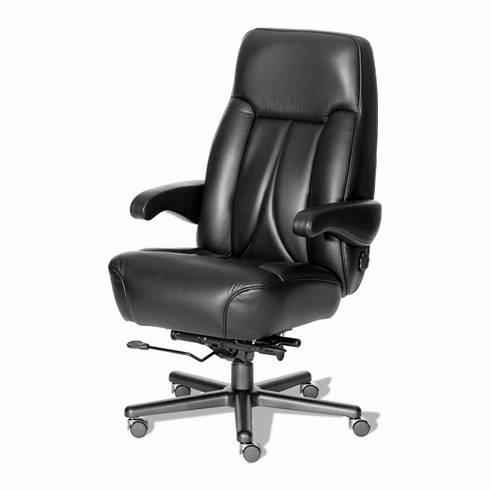 If you need some extra room to move in your office chair, check out the Odyssey Big and Tall 24 Hour Chair. For the comfort and cushiness you desire, this is the perfect seat. It comes with many features including; over-sized foam filled, contoured cushions, adjustable seat depth, 4-way adjustable lumbar support, rocker reclining seat back, tilt tension adjustment, pneumatic seat height adjustment, flip-up arms for easy entry and exit, optional height/width adjustable task arms are available and it is designed for long-term seating comfort. Other options on this model include a 30” steel base upgrade, soft wheel casters and this product is made in the USA.